Last night, the most prestigious awards of the year were presented to the leaders in the entertainment industry at the 85th Annual Academy Awards. Oscar host Seth MacFarlane presided over the festivities as emcee, and while he did an OK job, the entire night was pretty tame as he was on his best behavior and kept the majority of his jokes politically correct and appropriate for the massive audience of nearly a billion viewers worldwide. Aside from the bland hosting, things went mostly as planned with a few major upsets in a couple of categories, as well as a tie in one category. As unlikely as it seems, a tie has only happened twice before in Oscar history, the last time being in 1969, when Barbara Streisand and Katherine Hepburn tied for Best Actress. Even though all of my picks may not have won, having seen every major nominated film I do believe that nearly every single winner completely deserved it and I am happy with the overall results. Going into the Award Show “Lincoln” was the movie to beat with the most nominations, followed closely by “Life of Pi.” The top winners of the evening ended up being “Life of Pi” with four wins, followed by “Argo” and “Les Misérables” with three wins each. But who took home the biggest win of all for Best Picture? Look through the list of winners below and my thoughts on each. Going into the evening “Argo” was the film to beat. It has continued to pick up buzz as it steamed towards the Academy Awards ever since its release. I really enjoyed the film and have seen it multiple times already and everyone I have discussed it with has said they have loved it. While I am not surprised since it did win Best Motion Picture, Drama at the Golden Globes last month, I am happy to see that the voters in the Academy didn’t just go for the obvious choice and automatically choose Lincoln because of it its historical significance or the fact that it was a Steven Spielberg picture. This was the biggest shocker of the evening. I thought Steven Spielberg had this in the bag because of Ben Affleck’s absence from this category. I loved “Life of Pi” and thought not only was it beautiful looking, but it was an emotion-filled journey about a young man’s adventure to manhood and his unlikely friendship with a tiger. This marks Ang Lee’s second win for Best Director and I am sure there are more in his long and industrious career. This category was one of the top three safest bets in my opinion. Daniel Day Lewis is one of the most talented actors of his generation and his ability to live his characters for months at a time is astounding and proves that he truly earned this Oscar. While “Lincoln” can seem a bit long for some people, the best part of the film was his performance as one of this nation’s greatest presidents. This particular category has gone back and forth for months as popular opinion bounced between Jennifer Lawrence and Jessica Chastain to win Best Actress. “Zero Dark Thirty” was an incredible and stunning movie with excellent performances, but its subject made it somewhat of a black sheep. On the other hand, “Silver Linings Playbook” was a funny and touching film and a dramatic look at mental illness. The quirky performances given by Jennifer Lawrence and Bradley Cooper had you leaving the theater smiling, and that’s what presumably swayed the Academy votes in its favor. I do wish that “Silver Linings Playbook” had received more awards because it was so good, but this year’s contending films were one of the strongest groups of films in one year that I have seen in a very long time. This was the second biggest surprise of the evening to me. Don’t get me wrong, I love Christoph Waltz’s performance in “Django Unchained,” I just thought due to the abrasive and shocking subject matter and content of the film, mixed with the fact that he had just won this category three years prior for his performance in 2009’s “Inglorious Bastards” would conspire against him. Although Tommy Lee Jones and Robert De Niro were clear favorites for this category, Waltz’s charm and over-the-top character just seemed too hard for the Academy to ignore. I was hoping that Robert De Niro would have won since he hasn’t taken home an Oscar since “Raging Bull” in 1980. Hathaway has had a spot on her mantle saved for this award since even before “Les Misérables” was released. We have been hearing her fellow actors as well as the director sing her praises for the last year and rightly so. Although the character of Fantine is a small one in the scope of the entire film, Hathaway left a huge impression and brought many to tears by her honest performance of “I Dreamed a Dream.” That, mixed with her dedication to the role by having her hair chopped off in the film, made her a favorite to win ever since the nominations were announced. I should have known better then bet against Pixar and its incredible record when it comes to the Academy Awards, but I foolishly thought that films with more heart and better storylines that resonated with critics as well as movie-goers would have won no matter what studio made the film. I am standing firm by my choices that either “Wreck It Ralph” or “Frankenweenie” should have won this category; they were superior films that I enjoyed more than “Brave,” plain and simple. This was clearly a favorite of Academy voters due to it subject matter, an elderly couple dealing with the effects of a stroke that leaves the wife paralyzed on her right side and confined to a wheelchair. The touching portrayal of a husband being the dutiful caretaker of his wife who has suffered a life-altering disorder, and the love shown to each other, had all the makings of a great film that was right in line with what the Academy likes to reward with Oscar gold. While any Tarantino film is considered a wild card due to the abrasive and shocking nature of his films, he was able to take home another Oscar for his great writing because “Django Unchained” is a great movie. Strewn with controversy over the language and content of the film, it became a success at the box office and with critics alike who embraced the movie and who raved over the performances. 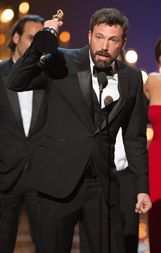 This category could have easily gone to any of the other contenders, but “Argo” ended up grabbing this award. The writing was suspenseful-filled and funny while also being very dramatic with developed characters and strong dialogue. One of my favorite characters in the film was played by the always funny Alan Arkin, who had some great one-liners I quoted for weeks after seeing the movie. This category has consistently gone to movies that have a classic or period setting, so it was a no-brainer that “Anna Karenina” had this all but wrapped up. While “Les Misérables” had a slight edge over the other competitors for runner up, it’s more somber tone and lack of flash to the costumes may have hurt its chances. “Skyfall” has been the clear leader in the song category and while I don’t believe it is the best James Bond song, it was well liked, which ended up winning it the award. I do think the only other serious contender for Original Song was “Suddenly” from “Les Misérables” as it was beautiful and touching. It’s a new addition to an already award-winning repertoire of songs from the Broadway show that fit into the film perfectly. Such a beautiful and endearing film like “Life of Pi” needed the soft and melodic background to help convey emotions and Mychael Danna’s did. I also thought that John Williams score for “Lincoln” was very strong as well, but at the same time it seemed very old fashioned and that may have hurt its chances. Every contender in this category was a very well made film, each with its own message, but it was the story of two Cape Town fans searching to find the truth behind the rumored death of their favorite musician. It is an appealing look at fans, faith and holds a positive message that just seemed to resonate with the Academy voters. This was a tiny upset for beating out “Open Heart,” which was a critical success and thought to be favorite for this category. Once again the touching and humanistic elements to “Inocente” won voters over through its message about the hopes and dreams of a 15-year-old homeless girl who aspires to be an artist. This is a truly great underdog story since the film was helped funded by the crowd funding website Kickstarter and now has won an Oscar. I enjoyed both “Open Heart” as well as “Inocente” and can see that both films are award worthy and should be watched by all if possible. This musical is one of the most touching I have seen in a very long time and besides the amazing music, it had a theatrical flair to the design of the make-up and costumes while also keeping it grounded in the reality of that era. One of my top favorite films of 2012, I am incredibly happy to see it win every award it can and see all the hard work that was put into making it rewarded with this recognition. As I have stated previously, the voters love period films and one of this historical significance was bound to get some Oscar love. Only having seen the film once, I don’t remember that much about the production design in detail, but that I was very impressed with how period specific and precise all of the sets and locations looked. While many don’t notice the editing of a film, it is one of the most important aspects of behind the scenes work there is, because editing helps to drive the story, mood, pacing and suspense. It takes a very talented mind to see what footage to use, angles, plus a million other factors to help get the story onto the screen. I also believed that “Zero Dark Thirty” had a strong case to win this award because while its technique was similar to “Argo,” the feel of the movie was very different. This is a well-deserved win for the film because along with the special effects department, they created an entire and wondrous world for the movie to take place and all of the technical aspects to shooting a film where the environments and most of the characters aren’t there and will be added later using CGI effects has to be a daunting and was so flawlessly done you never even knew that it was happening. Here is the infamous tie I spoke of earlier, and it actually makes sense when you think about all of the sounds you have to balance in all the action in “Skyfall” as well as “Zero Dark Thirty.” I also thought “Life of Pi” had a chance in this category, too, but am happy with the results and glad that two excellent films were able to take home this award. Once again this movie was a clear frontrunner for this category because of the hardships and problem-solving it had to go through to be able to record the cast singing live, every take, and then have to balance out the background sounds as well as adding in the music from the orchestra to make the perfect sounding musical performances. I am glad at the level of attention and praise singing live has gotten from “Les Misérables” and I hope that future directors take a hint from Tom Hooper and attempt to make musicals this way as performances and more raw and touching when you can see the face and emotions that match precisely with what they are singing at that moment. While I would love to see Marvel’s “The Avengers” in this spot, I have to admit that the visuals of landscape, water , animals and everything else created by Rhythm & Hues Studios for “Life of Pi” are some of the best and photo-realistic that I have ever seen. My first time viewing this film in theaters my friend did not even realize that the tiger in the movie was not an actual tiger until told so. So they say the best compliment a visual effects designer can get is that you don’t even notice their work and with “Life of Pi” they have done exactly that. While Disney may have lost the award for “Wreck It Ralph,” it hit a home run when it came to the animated short film “Paperman.” Being a silent black and white film made it feel classic and the mixture of traditional hand-drawn animation and incorporated CGI effects gave it the perfect blend and you can watch this Oscar-winning short film on YouTube right here. This is the story of a man on the verge of suicide when he is asked to watch after his niece, Sophia, and whose day together teaches each of them about life and looking at things differently. Even though this short is only 19 minutes long, it leaves a large impact and the turmoil as well as joy in it helped win it this award. While the voting Academy has clear guidelines by which they like to choose movies, the heart behind “Curfew” must have won them over. So there is the list of the winners at last night’s Academy Awards. Did your favorite films pick up any awards? Did you agree or disagree with any of the winners? Leave a comment and let us know which film you were glad to see take home Oscar gold last night. I haven’t seen all the movies that were nominated of Picture of the Year. But I disagree with Argo. Although it was a good film, I didn’t find it “great”. I think Les Mis was way more superior of a film in all aspects. As far as best Actor, as much as I wanted Hugh to win, I figured Lincoln would win that. Best Actress, not seeing any of the movies, I have no say, but I am happy for Jennifer Lawrence, she is amazing. Anne Hathaway truly deserved her win!!! Skyfall deserved the win as well. It is a great song, not just Bond song. Beautifully written, and of course Adele’s performance of the song is truly beautiful as well.